In addition to our consultancy services and desiccant products, we now offer a Contract Packing Service. The service suits those companies who need to out-source production or don’t have the ability to pack products cleanly. Baltimore Innovations have built long-standing partnerships in the UK and Europe. Above all, we have been helping over the years many word-class medical companies. Therefore, we can guarantee a reliable and on time service. We have ten ISO 14644 Cleanrooms at our disposal. Hence, we can package a wide variety of medical products, from simple wound-care dressings to Class III implants. Our experienced staff can also advise you on product and pack design, prototyping, production tooling, validation work, product assembly, cleaning, sterilisation and CE marking. As a result of our expertise, your products can reach the market on time and within budget. All post-pack sterilisation work is sub-contracted to our approved ISO accredited partners. Consequently, this ensures efficient and effective microbial elimination. Furthermore, ultrasonic cleaning (if required) takes place in a dedicated Class-7 cell, prior to packing. It is a fully validated process and therefore gives added assurance of near zero contamination and bioburden. Quality …we are an ISO:9001 accredited company, using ISO:14644 cleanrooms, so quality is assured. Proven …we are already helping many word-class medical companies. Safe …our sterilisation and ultrasound cleaning services offer 100% peace of mind. 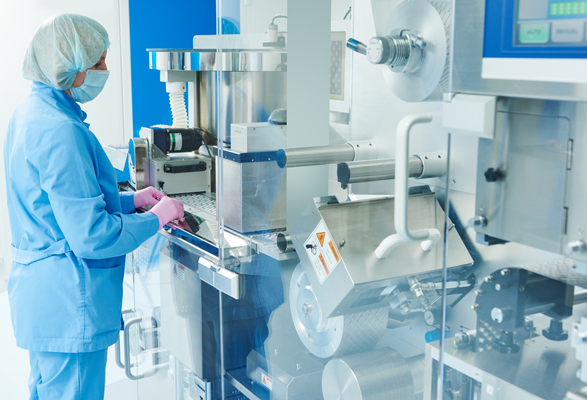 if you need to out-source production, don’t have the ability to pack products in your own Cleanroom, or any other problems that you have, please give us a call on +44 (0)1628 531900.